and added SCRAPS of pink, yellow and blue. I ran out of gray. The border squares don't have any gray. This was my view as I put those squares together. My camping trip was COMPLETE! and my friend let me borrow this beauty!!! and Summer is in FULL swing! I've been doing a lot of camping. so I'm not quite ROUGHING it. and I am SO proud of that FRINGE!! I bought a little tool called a fringe twister. after seeing my friend Barbara weave hers! 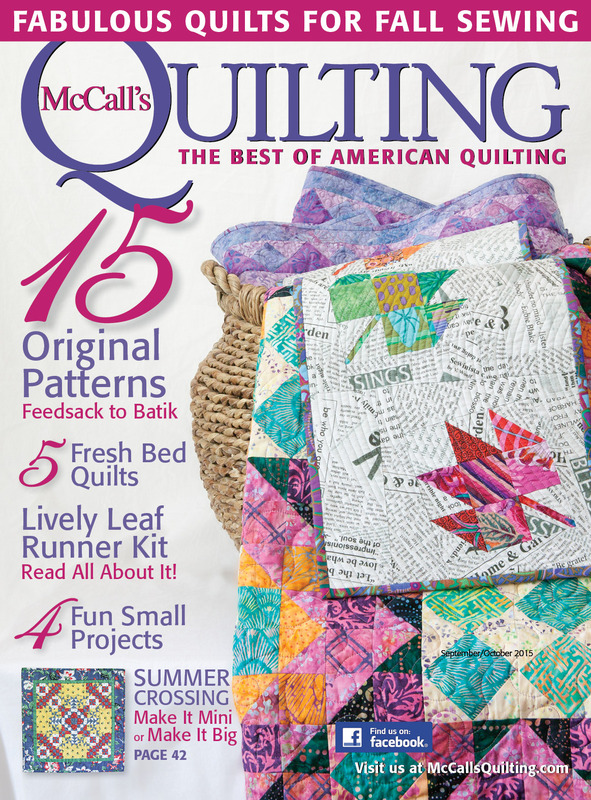 Thank you EVERYONE for your kind words about my recent quilt pattern for McCalls! The winners are Frances and Karen. Send me your address and I'll send you a copy of the magazine! 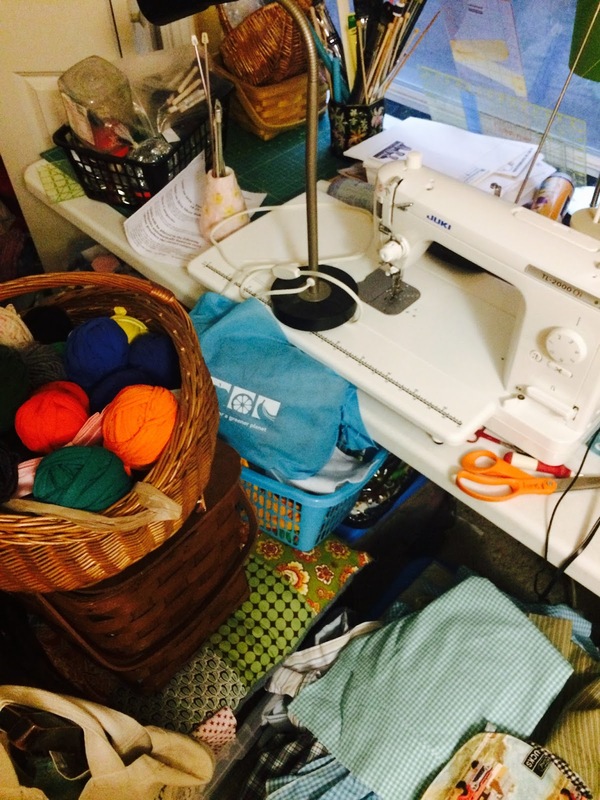 Hope YOU are getting some sewing done!! My sewing room is under construction. Hoping it all ends very soon. I received a few more quilt blocks in the mail recently. That means we have ONE more quilt for Charity!!! I love these collaborative quilts. and ready to GIVE away!!! 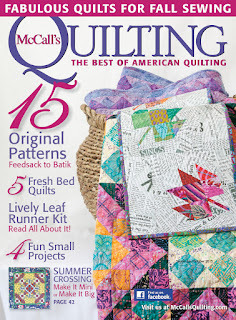 My quilt pattern is in the newest issue of McCall's Quilting. 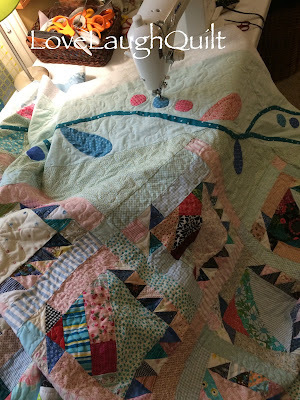 My fun scrappy basket quilt top is NOW a quilt. Quilting continues to challenge me. They are literally RIGHT under my NOSE! I don't notice ANY of the troublesome stitches. and I'm ready to SLEEP in peace. I received this lovely old quilt top this week. It found a VERY happy home. I love the plaids and stripes in this block. So many fun fabrics to LOVE in this quilt!!! The weeks and days go SO fast! All the activity keeps me happy. This wrap is in progress. Maybe it'll be done this week. Can you see the produce in the background?? Can't let all that garden goodness go to waste!!!! 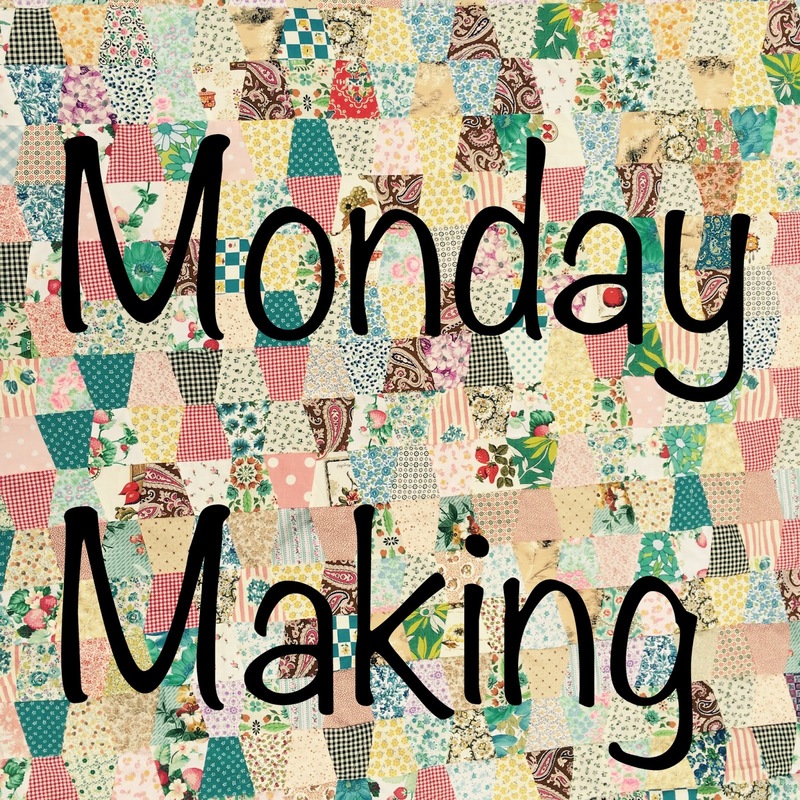 Link up and let us know what Monday making plans YOU have! I began a journey yesterday. Let's call it a HUNT! I know this journey will be delightful! It will involve trips to the library to find more knitting books. and POSSIBLY purchase something appropriate for this quest. Isn't that called turning the heel?? It would be so nice to travel with YOU! Wanderings with needles and yarn!!!! that I've had for a while. 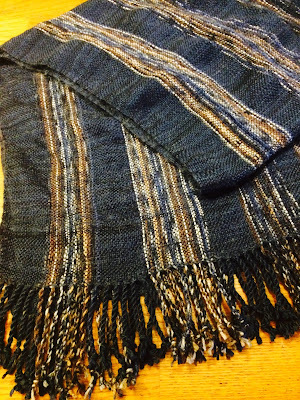 It's a pretty basic KNIT, fold and add a seam pattern. I added a ribbing to the cuff. I'm PROUD I did it!!! I made the WHOLE thing! That's what I need to focus on as I wrestle with my friend here. 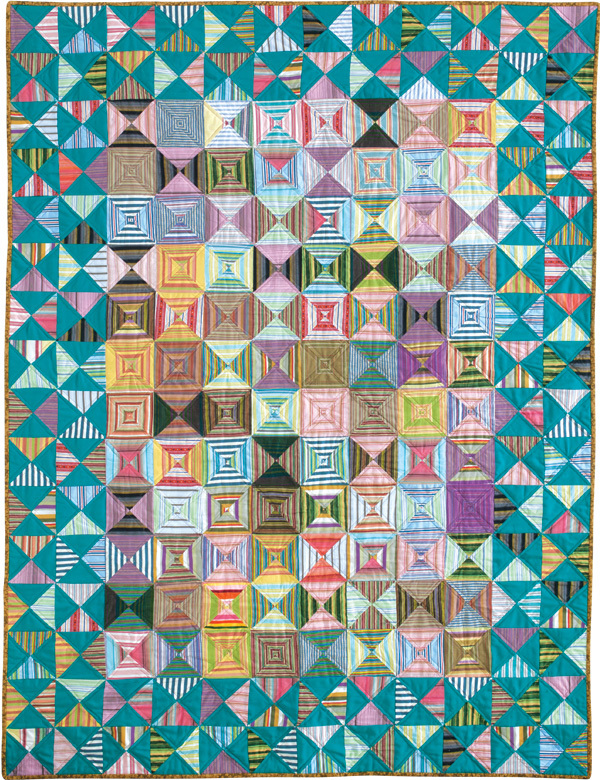 I know I will love making my bed with this PINK and blue quilt! I'm going to PLAY with scraps. 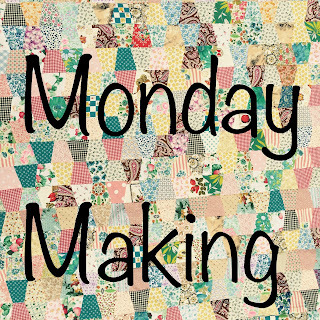 I started the day with a little sewing. I'm going to enjoy it ALL week! Holiday Hexagons are not ONLY for Christmas. to celebrate this time of year here in the U.S. Thanks to everyone who sent blocks to be included. There are a few more that will be puzzled into a SECOND quilt! and then sent off to the wounded warrior project.